The interactive table enables Savremena’s students to cooperate more easily during studying, and gain new knowledge and explore the world around them in a fully interactive manner. This modern, touch-sensitive device (responds to pen or finger) may be simultaneously used by several people, and its most important goal is learning through play, which increases and develops the will to learn among students. Thanks to the design which encourages more involvement and better cooperation, the device is used in many schools around the world, and is now available at Savremena. Teachers, as well as students, use the interactive table. 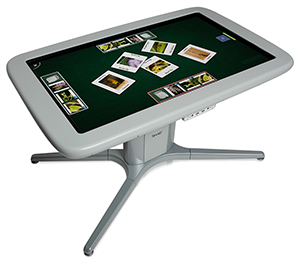 In addition to the numerous activities it provides, the interactive table makes it easier for teachers to design interesting lessons and quizzes, so as to enliven the learning material; combined with the projector and computer, it makes lessons truly different.